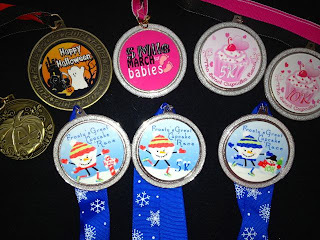 Running In Sanity: Virtual Race Medal Closeout! Whenever we order medals for our virtual races, we order extras to make sure we have enough in case medals are lost or damaged in the mail. 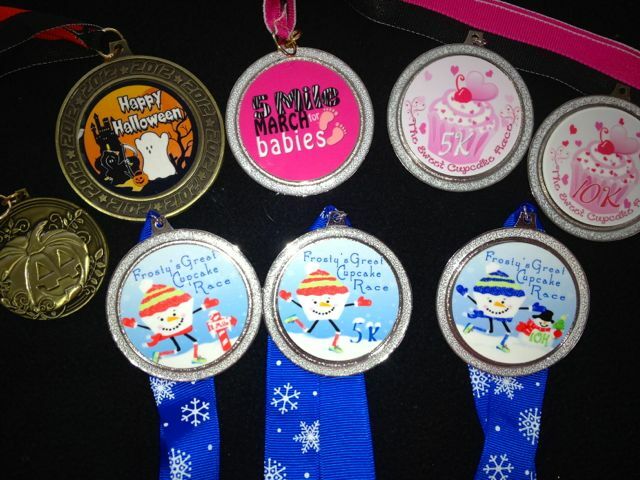 Well, we still have some left from previous races, so if you missed out on any of these great medals, here is your chance! The money raised from the sale of these medals will go to Team in Training, except the 5 Mile March for Babies- money from those medals go to the March of Dimes. Please use the PayPal box to purchase the medal of your choice! All medals will be shipped within 3 business days. Thank you for your support and participation! Would love to get some medals for my kids. Do you ship internationally (Sweden)? I will ship internationally, but there will be additional shipping charges. Will you please email me at run.in.sanity@gmail.com and let me know what you want? I can create a PayPal invoice for you and will get your medals in the mail to you! Thank you! How many of The Sweet Cupcake 5k and The Sweet Cupcake 10k do you have left? Have a group that I would like to do a CUPCAKE RUN with and love these medal but want to see if you'd have enough for anyone that wants to order one! Would probably need 8-15 of 5k or 8-15 of 10k!